Your house and its surroundings provide many ideal places for your small, private, beautiful garden. It’s not necessary that gardens and landscaping plans require large vacant spaces of land. An economical use of space and adequate irrigation facilities along with the choice of proper plants can help you create the perfect garden. Usually, container or potted plants are the best options for suburban gardens or gardens in small city backyards, rooftops, balconies, patios, steps or lawns, and driveways. There are many varieties of plants that you can choose from. Evergreen trees aren’t generally a common choice for small gardens, courtyards, or small patio ideas. Flowering deciduous trees are more useful. Herbs and shrubs can be planted. The plants must be according to the climatic conditions. Whatever be your choice to make sure that the plants are chosen in order to complement the décor of your garden. You can select hanging ivy geraniums or fuchsias and creatively stylize your terrace walls. Or you can choose green shrubs and arrange them neatly in symmetrical rows along the sides of the terrace. Potted plants in ornamental pots or urns can be placed around your entrance doors; however, make sure that these plants are not exposed to harsh rays of the sun as otherwise, they might wilt. Side and rear entrances can look sunny and cheerful with tubs of petunias, dwarf dahlias, fuchsias or tuberous begonias. There are many spaces within your house that are ideal for small gardens. Rooftops and sundecks can be exploited to put sun-loving plants like cacti or geraniums. These plants can be placed in large boxes or planters along with evergreen shade trees and shrubs. The lamp posts in the yard or other parts of the landscaping can be dressed up with container plants around the base or ivy geraniums kept in quaint black kettles. In fact, when it comes to small gardens, there are a wide variety of plants from which you can choose. However, make sure that you also select proper places for these plants and accessories to complement them. Select the right kind of plants. The entrance to your house can be lined with small herbs, flowering plants. Porches and verandas can be decorated with plants in pots. Patios and terraces can be decorated with ornamental herbs. The walk to the house, driveway, garage or garden can be lined with container plants. Terrace walls can be creatively stylized by using hanging plants. This is commonly found in Spain, Portugal, and Italy. Despite myriad advantages, the Small gardens often come with a number of problems as well. The gardening space might be very small or exposed to harsh sunlight. It might also be at strange angles. In case you have remodeled your house or changed the elevation or added a new room, designing your garden might be a problem. Ensure proper irrigation and drainage systems. Most plants in small gardens are delicate in nature and require constant watering. 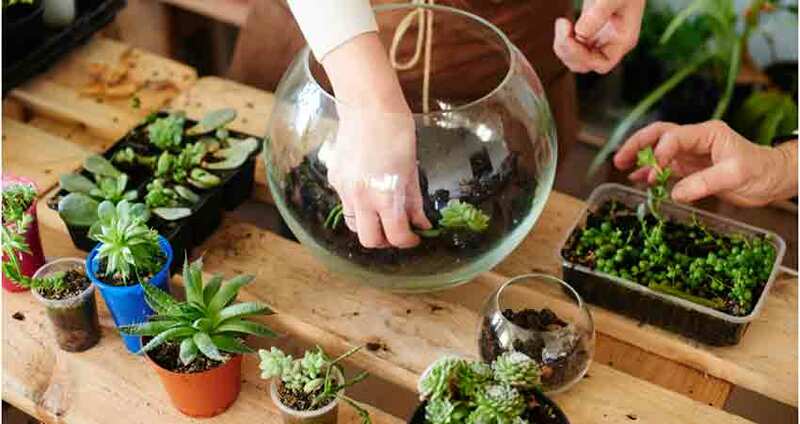 Choosing a suitable angle of arrangement, like placing the container plants in a north-south direction so that it gets the warmth of the sun all day long. Avoid exposing the delicate plants to harsh sun rays. Did you enjoy my ideas? Feel free to like or share! What’s your favorite plant for the small garden?